Buying a mattress can be confusing for many reasons. One such reason is the sizing guidelines for mattresses. It can be hard to know how big a size really is and how much space you need. Regional differences in mattress sizes complicate things further. 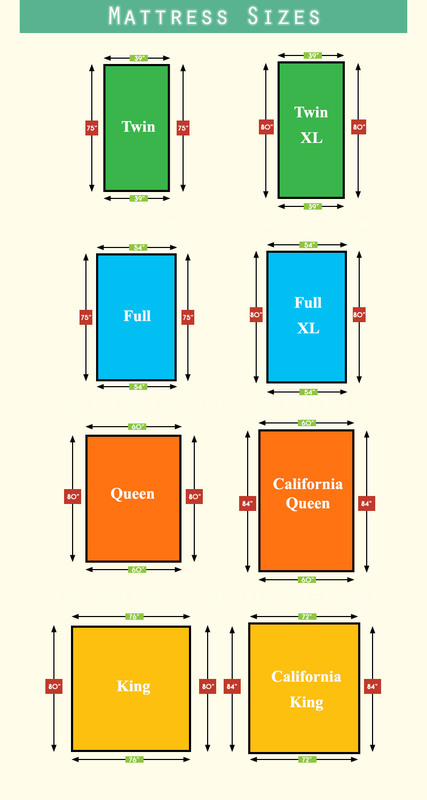 Twin, full, queen, and king are the standard North American sizes for mattresses. These are the sizes you’ll find in most mattress stores. When purchasing sheets, comforters, frames, and box springs, you’ll notice these sizes are the easiest to find. Twin size mattresses are ideal for children or single sleepers who don’t need a lot of space. A typical twin size mattress is 39 inches wide and 75 inches long. Occasionally, you may see this size referred to as a single, but twin is the more common name for these mattresses. Full size mattresses are preferred by many adults who sleep alone. These mattresses are 54 inches wide and 75 inches long. Though these are sometimes called a double, they are not really twice as big as a twin, or single, mattress. In fact, for a couple sleeping in the same bed, a full size mattress may not provide enough space for both partners to sleep comfortably. Keep in mind also that 75 inches is only 6 feet and 3 inches. If you or your partner are on the taller side, a full size mattress may not be long enough to accommodate you without your feet hanging off the end. Queen size mattresses are the most common mattress size for couples. A queen size mattress is 60 inches wide and 80 inches long. This is plenty of space for some couples, but if you or your partner move around a lot in your sleep, you may find yourselves kicking each other at night. A queen size mattress only gives each partner 30 inches, or two and a half feet. This is enough room for most couples to lay next to each other as long as you stay still all night. If you sleep alone but like to spread out or roll around, a queen size mattress is perfect. It’s also good for couples that like to snuggle up while they sleep. King size mattresses are the largest mattress size you’ll find in most stores. A king size mattress is 76 inches wide and 80 inches long. This is far more space than any one person will likely need, so king size mattresses are usually used by couples. With a king size mattress, each partner has about the same amount of space as if you each slept on a twin size mattress. When purchasing a box spring or foundation for a king size mattress, you’ll typically find it’s easiest to put two twin sizes together under one king size mattress. Other mattress sizes may deviate from the standard sizes, but are still not unheard of. These sizes will be a bit harder to find sheets for, but may suit your needs better than a standard size. Twin XL mattresses are most often seen in college dormitories. A twin XL mattress is 39 inches wide and 80 inches long. If you’re comparing a typical twin size mattress to a twin XL, you’ll notice that you get an extra 5 inches with the twin XL. This is good for single adults who don’t need a lot of space, but don’t want their feet hanging off the edge of the bed. If you’re over 6 feet tall, a twin XL will be significantly more comfortable than a twin size mattress. California King mattresses are slightly different from a king size mattress. A California king is 72 inches wide and 84 inches long. This gives you a little less room to roll around than a king size, but you get an extra four inches in length. In fact, a California king is a full 7 feet long. If you or your partner are very tall, this may be necessary for comfort. California king mattresses are also great for people who like to let pets sleep in the bed. A cat or dog can easily curl up at the foot of the bed and still leave plenty of room for humans.